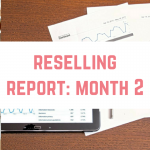 Welcome to our first ever monthly reselling report. We have recently started reselling on eBay and looking into FBA (Fulfilled by Amazon) and we wanted to share our journey with you. 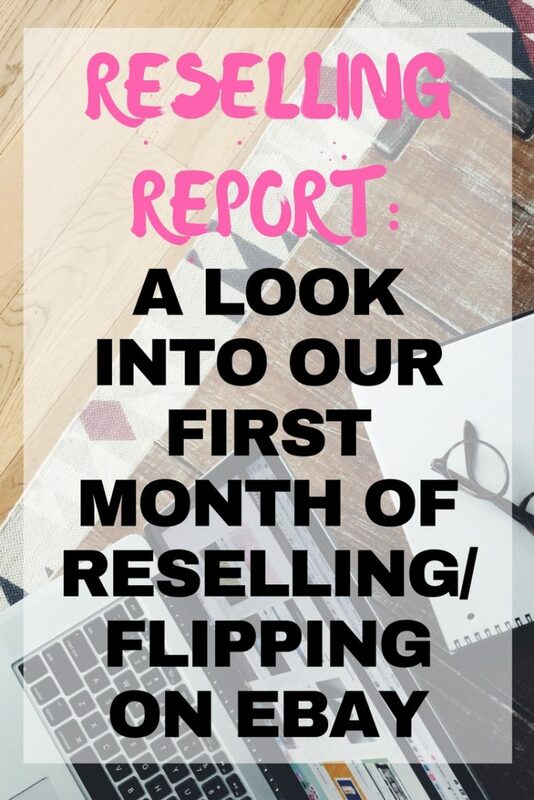 We absolutely love reselling and can't wait to share our progress. Here is how we did in our first month. 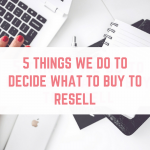 Reselling, or flipping, is where you purchase an item and resell it for a profit. We are focusing on selling on eBay or Amazon. eBay sellers who are reselling items need to be registered as a business in order to comply with eBay's terms and conditions, and you need to register with HMRC and declare your extra income. You can learn more about reselling at Tony's blog. 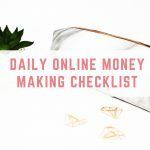 When it comes to working for yourself, it is really important to diversify your income so that if one income stream takes a hit, you aren't losing out too much. 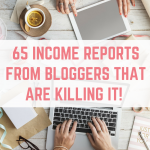 I am always looking at ways to diversify our income, and reselling seemed like the natural progression. Both Tony and I have a good eye for finding items we know will sell for a lot more – Tony is great at spotting “nerd stuff” like retro games, Warhammer and similar items, whereas I'm good at clothes, shoes and good at watching allllllllll the reselling YouTube videos out there and picking up suggestions. I have previously purchased the odd thing to resell (remember my amazing camera haul), however we decided in January 2017 to really make a go of it. We started a new business account on eBay (yep, with zero feedback) and started to dedicate some time to reselling. We also love the variety that reselling gives us. 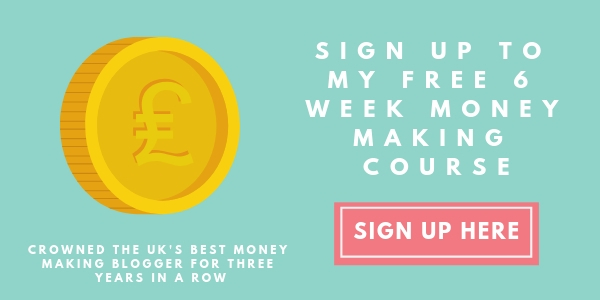 If we are out and about for mystery shopping then we can easily pop into some charity shops, or if we have a day where we really cannot stand to be in front of a computer, we can head out and still be doing something to earn us money. We aren't full-time resellers and we don't aim to be, we are simply adding another side hustle to our list. Be sure to follow our dedicated reselling Instagram account to be kept up to date. * This amount only deducts the cost per item for items that have sold, and does not take into account all the other items within our inventory. January 2017 has been our first month of reselling, and what a month it has been! As it has been our first month, we have had a steep learning curve. The charity shops closest to us are extremely expensive, although Tony did spot an item for £2 that ended up selling with a profit of over £50! We have traveled a lot – 245.6 miles to be exact, to scope out the best charity shops, auctions and car boot sales. We have now struck off a few locations from our list, meaning we can focus on the best places to source stock. We'll revisit this every once in awhile, but we won't be making 60 mile round trips for places where the charity shops are priced too high (honestly, £5 for one DVD from a charity shop is insane!). We have spent £372.34 on 134 items of stock, of which 11 have sold. 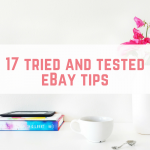 Those 11 items got us a profit of £176.73 and we ended the month with only 46 items listed on eBay. That means there are still 77 items that we need to get listed. Our other expenses this month, £15.59 were for 100 jiffy bags, car boot sale entry and car parking fees. Overall we are really thrilled with our first month. We know that we have to work harder to get items listed faster! We have had a really great month sourcing items, with a total of 134 items purchased to resell. My favourites were at our first ever auction, where we were walking away with boxes of clothing, shoes and games for £1 each. This is my new favourite way to source things! Be sure to check out our reselling Instagram to see our latest finds. The things we have bought have been a real mixture of products, as you can see from the Instagram photos below, and the videos. We haven't stuck to a niche, we've simply spotted items that have piqued our interest and searched eBay to see how much they have sold for. I have published two YouTube videos of our reselling hauls in January, which you can watch below. If you like reselling videos then be sure to subscribe on YouTube to be notified when new ones come out. 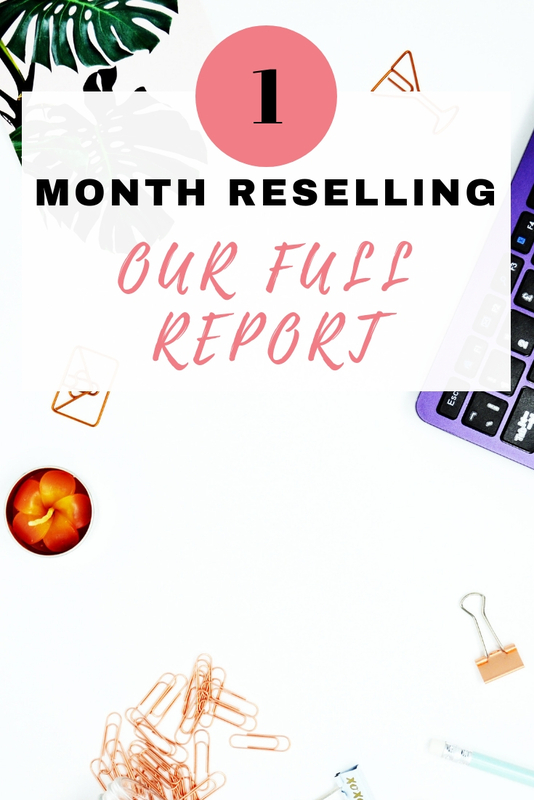 So there you have it, a report of our first month of reselling. 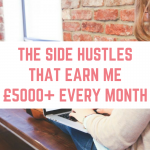 We are having an absolute blast with this side hustle! If you have any reselling related questions then please do let us know! Previous Post: « Squirrel Away Your Savings! 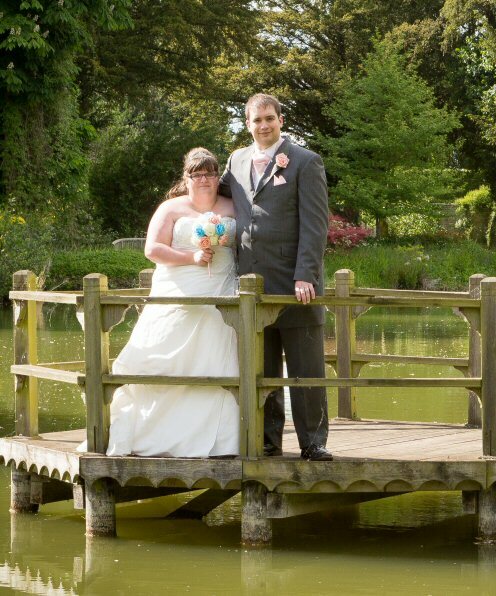 This is fab you two! I have watched your videos and looks like you are doing great 🙂 my own progress with this is super slow as I have a tiny amount of money to buy stock with! I have been looking forward to seeing how your first month went. Well done! 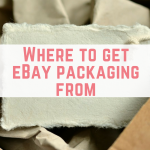 How can we see your items for sale on e-bay? maybe you have just the thing that we are looking for. e-bay seems to have ditched the facility they had where you could enter the item you were looking for and then the sellers could send you a link to the items. I need to apologise as I should have sent you a comment years ago. I’ve always enjoyed a yellow sticker and money saving expert but you took my money saving to another level. First thing I remember is the Disney film club points in dvds, I used those points to buy limited edition sleeves which I sold on eBay. I’ve heard of a lot of supermarket cashback apps through you, and tesco orchard. 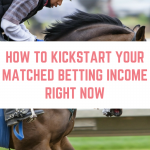 Then there is matched betting, I’ve made over £3k so far dipping in and out over the past 18 months. But the biggest one is probably reading the secret as you recommended it! That book has led me to looking to change my career in order to spend more time with my daughter. I’ll also be reselling on the side, again inspired by you, which is a bit silly really as I’m a retail merchandiser (analyse and buy stock etc) so I should have thought of that on my own steam sooner! So in true the secret fashion- thank you! Thank you, thank you, thank you you have made a significant positive impact on many aspects of my life and I can’t really thank you enough ? Well done – sounds like you’re off to a great start!